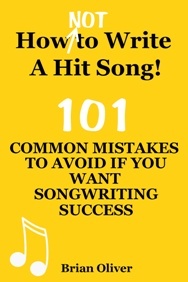 One of the most frequent mistakes in lyric writing is trying to evoke a strong emotional response in listeners simply by stating what you’re feeling or thinking (for example, “I’m getting mad” or “I’m feeling down”). This is actually one of the least effective ways to make a lasting connection with the people who hear your song. In the verse lyrics especially, you need to show listeners what the song is about by painting vivid word pictures that describe the physical experience of the emotions you want to convey. In other words, invite the audience into the world of your song by allowing them to “watch” the story unfold like a movie. If you describe each scene as if you’re looking through the lens of a film camera, you’ll be able to help people ‘see’ and experience what the performer of your song is feeling. You can also help listeners to enter your song by including descriptions of familiar, tangible objects in your lyrics—such as an empty chair, a wine glass, a framed photograph, and other concrete nouns which refer to physical entities that can be observed by at least one of the senses. These images are more likely to engage listeners than a dull statement of fact. “SURPRISING RHYMING” – The Alternative Rhyming Dictionary for Songwriters and Poets – is available from Amazon as a US paperback, a UK paperback, and also across Europe. Read more about the book HERE (USA) and HERE (UK).